NIRANKARI BABA , Chandigarh, January 23, 2015: Know the truth of Oneness of God and you will realise the truth of the Oneness of Mankind. This is the only way to end the prevailing confusion, tension and violence in the name of God, religious faiths, prophets and places of worship and bring man closer to man. Sh. Mohinder Singh Ji Sanyojak said at Sant Nirankari Satsang Bhawan Sector 30-A, that His Holiness Baba Hardev Singh Ji Maharaj, Head of the Sant Nirankari Mission while inaugurating the 48th Annual Nirankari Sant Samagarm of Navi Mumbai Maharashtra. Organized in a vast township of tents put up in the sprawling grounds near Central Park in Kharghar, Navi Mumbai, the 3-day spiritual get-together is being attended by lakhs of devotees of the Mission and other God-loving people not only from all over the State but several other parts of the country also. Many delegates from other countries are also participating. His Holiness said that man is suffering today because he is not familiar with the truth. He is fumbling and stumbling in the darkness of ignorance. And it is most unfortunate that religion that is always expected to teach us love, compassion and togetherness is creating distances, causing fissures, erecting walls and thus, causing confusion, tension and violence all around. Baba Ji stated that what man needs to know is that the soul residing in every human being is the particle of God, and when God does not belong to a particular religion or sect, how can the soul do? That is why, Baba Ji said, we talk about the realisation of Self through the realisation of God. Once we realise God as one Supreme Entity despite numerous names, we understand that the soul, a particle of the same Super Soul resides in every human body and thus, making the entire mankind one. In this way, by realising the Oneness of God, we understand the Oneness of the Mankind. Explaining it further, His Holiness stated that once we realise that God is one, we understand that God being worshipped by one religion is the same as worshipped by others, even when they use different names and different modes of worship. And this leads us to understand that since the Supreme Father is one, all His creation, the mankind is also one, a single global family. This brings tolerance, peaceful co-existence. We also understand that born as a human being, man is a human being first and anything else later. So, let man live and behave like man. Baba Ji said that this is the message of truth sought to be conveyed to the world from this Samagam. This vast beautiful get-together itself presents a beautiful example of unity in diversity, love and tolerance based on the realisation of God as one. Referring to his holy mother, Nirankari Rajamata Kulwant Kaur Ji who expired on August 29, 2014, Baba Hardev Singh Ji Maharaj said that she graced all the previous 47 Annual Sant Samagams of Maharashtra and it is for the first time that we miss her in physical form on this occasion. Baba Ji, however, added that even then the spirit of love, devotion, humility, service and sacrifice taught by her through word and deed will always guide us, inspire us, to take this Mission of Truth, peace and tolerance further. Earlier, thousands of devotees participated in a colourful procession to greet His Holiness and his gracious spouse Pujya Mata Sawinder Ji and then lead them to the venue of the Samagam. 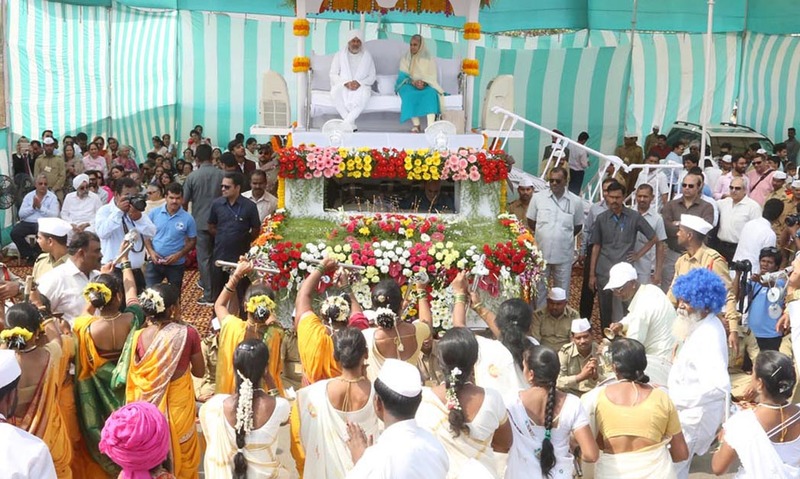 Clad in traditional costumes, dancing and singing and presenting a beautiful picture of unity in diversity of cultures, languages and regions, they marched past from in front of the divine couple seated in a sweetly decorated open vehicle and sought their blessing. Several Band Parties, Lazium, Kalash, Dandia, Bhangra, Giddha, Adivasi and other folk dances and devotional songs marked the procession. Several models and palanquins were also used to bring out the messages of love and devotion. Different aspects of the Mission’s ideology were also highlighted through banners and placards carried by devotees in the procession, such as ‘Religion Unites, Never Divides’, ‘Love adorns the garden for life, while hatred destroys it’, ‘May Truth prevail along with love and harmony’ etc. The Sant Nirankari Charitable Foundation also explained its objectives through a huge model.